With the unfortunate arrival of Ebola from West Africa and the possibility, although remote, that it might go global under the right circumstances, we thought it might be appropriate to look back at one of the world’s most famous pandemics, Black Death. Also known as Bubonic Plague, this epidemic intermittently broke out in Europe from 1347 until about 1750. 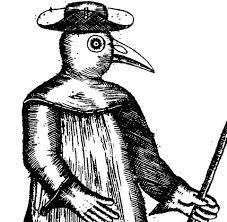 Without a doubt the best recorded case of what happened concerned the Great Plague of London in 1665-66. Most likely the epidemic came to England on Dutch ships. Amsterdam had been hard hit by the disease where an estimated 50,000 persons died in 1663-4. While today Ebola is most likely to come to America by air, several cargo ships arriving in U. S. ports from Liberia, Guinea and Sierra Leone have been prevented from unloading cargo as a sailor aboard was diagnosed as having the disease. Although the number of deaths in West Africa has not matched those of 17th century London, cases are increasing at a geometric rate. Several healthcare organizations estimate that over 1,500,000 in Africa could succumb to Ebola. During that two year period (1665-6) approximately 100,000 individuals, 15% of the population of London, died. One major reason for the carnage was no one understood Bubonic Plague. The credulous citizens believed sources of the pandemic included emanations from the earth known as “pestilential effluviums,” bad weather, infected livestock, odd behavior of animals and an infestation of mice, frogs, moles and flies. Authorities decided that each church parish in the city appoint “searchers for the dead” who went from house to house trying to determine the cause of death. Needless to say, these individuals had no qualifications for the job. These “searchers” were forced to live apart from the general population and remain inside unless they were preforming their official duties for fear of exposing others to the plague. They were required to carry a white cane to identify their “profession.” Often these individuals wore plague masks in an attempt to prevent inhaling the “pestilential effluviums.” (See sidebar The Dark History of a Venetian Carnival Mask.) A plague house was marked with a red cross on the front door and the words “Lord have mercy upon us” was painted on the building. In addition a watchman was stationed at the home to prevent the inhabitants from leaving. As the pandemic escalated, London hired drivers to operate death carts to pick up bodies. The cry of “Bring out your dead” was heard day and night. 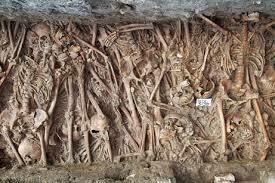 Often bodies were stacked up against house walls. Initially the deceased were buried in church cemeteries. However, as the plague progressed, there were just too many corpses, so huge mass graves called “plague pits” were dug and thousands of bodies were quickly dumped in and covered with dirt. Archeologists have unearthed many of these over the years. Like today in Africa no one wanted to let on that a member of their household was infected. So Londoners did just what West Africans are doing, hiding these infirm persons. And again, like now in Africa, “searchers” were taking bribes to say a household was healthy and reporting falsely low numbers of the actual number of diseased individuals. Finally London established a quarantine system that stated that any home that had a death must keep all residents locked inside for 40 days (it’s 21 days for Ebola) and not allow anyone to enter or exit. In many cases this action became a death sentence for the inhabitants. A major reason the Black Death reaped such a large segment of the population was that no one really knew what caused it. It was not until 1894 that a Swiss physician, Alexandre Yersin, discovered the causal agent was a rat flea (Yersinia pestis) that transmitted the bacterium by biting a human.